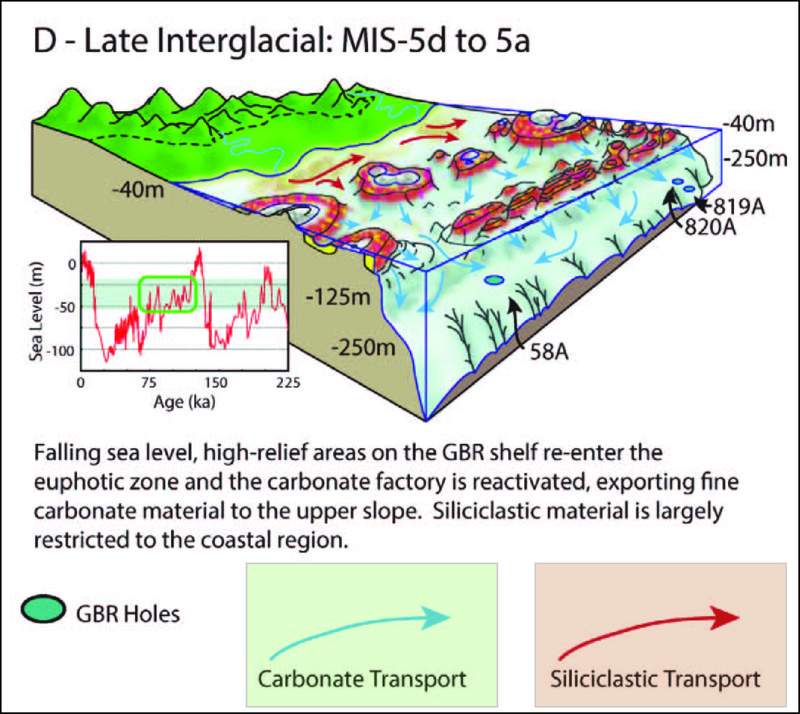 A new model of siliciclastic-carbonate sedimentation along the Great Barrier Reef margin? For those interested in the GBR and siliciclastic-carbonate sedimentation, check out the new paper from our GRG international colleagues below (Harper et al., 2015). This is a very interesting paper that presents a new sediment record from upper slope of the central Great Barrier (off Cairns) that was drilled during IODP Expedition 325 (Great Barrier Reef Environmental Changes). It discusses a really high resolution record of sediment flux changes on the upper slope through Termination II and through most of the Last Interglacial and beyond (ie. from about 150 to 75 ka). Model of GBR margin sedimentation (after Harper et al., 2015; Journal of Sedimentary Research, v. 85, no. 9, p. 1019-1036. Surprisingly we find that the peak of maximum neritic aragonite (i.e. shallow water carbonate) export to the upper slope occurred not during peak MIS-5e highstand (~125 ka) when sea level was a few meters above modern position, but during a time (~115- 80 ka) when lowered sea level fluctuated between 30 and 50 m below present sea level. Check it out!